Today kicks off an exciting new venture that involves delving into the world of eating healthier by more unprocessed, whole, and natural foods into our lives and diets. If you've hung around here long enough, you probably know that I'm a huge fan of Mark Bittman and all that he does. He was our features cook/chef for six months over at IHCC, and since that time of cooking with him on a weekly basis, I haven't let him out of my line of vision. One of the first cookbook I ever bought all for myself and by myself many moons ago was How to Cook Everything. And many years later, when I came across Mark Bittman's Kitchen Express, it renewed my interest in Bittman. Shortly after he released Food Matters: A Guide to Conscious Eating, which is basically a plan for responsible eating that's as good for the planet as it is for your weight and your health. While Food Matters contained 75 recipes, he followed it up with The Food Matters Cookbook which contains 500 recipes...revolutionary recipes for better living, to emphasize the subtitle. The Food Matters Cookbook is a "guidebook to resposible eating" that emphasizes Bitty's easy-going approach to everything in the kitchen. No preaching, just a fantastic, flexible argument for eating more plants while cutting back on animal products, processed food, and junk food. It's not about avoiding certain food...it's about ratio. Filling your plate with more whole grains and vegetables and using meat sparingly and as a garnish. And since I am the ultimate cheeseslut and dairy-lover who also enjoys a juicy steak, slow-cooked fall-apart pork, and the occassional Cheddar Jalapeño Cheeto...I love this approach. And I'm not the only one. Sarah from 20 something cupcakes and Kate from Cookie + Kate feel the same way and decided to take it to the next level by starting a sort of cook-along group called The Food Matters Project. Basically, The Food Matters Cookbook will be our guide as a different blogger hosts every week. The host will pick a recipe from the book and post it on their blog on a given Monday. All of the other "players" will make the same thing, posting it on their blog with a link back to that weeks host...who will feature the recipe at their place. With so many different bloggers out there, it'll be a fun experiment to see everybody's interpretation of Bitty's recipes...especially since he offers so many fantastic variations. So, if you're interested in cooking along, head on over and check out the schedule...you can even sign up for a hosting spot, if you wish. 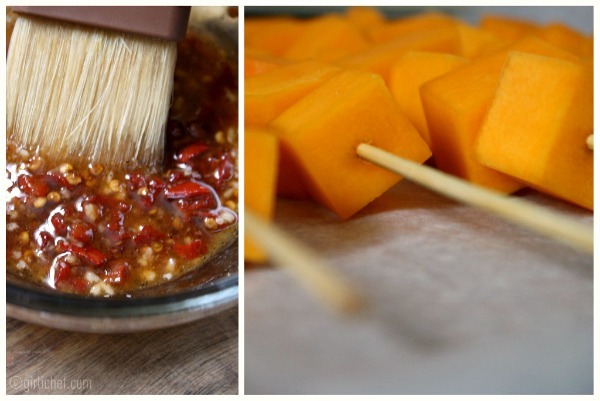 Sarah of 20 something cupcakes is kicking things off this week at her place with her choice: Chipotle-Glazed Squash Skewers. I mentioned my adoration for roasted winter squash not too long ago. That earthy sweetness is perfectly complimented by the slow heat of smoky chipotles and a kiss of honey. 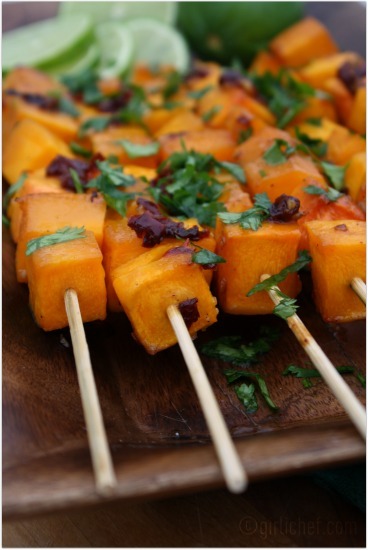 Pass the skewers with lime wedges for adding a hit of bright citrus and a smattering of grassy cilantro for scattering. Smattering for scattering. Ha! I'm not changing that...it's fun to say. Okay fine...with a pile of chopped green cilantro for scattering. You could serve these on their own or atop a pile of warm farro laced with wilted greens...my personal favorite. Heck, I think they'd make a great accompaniment to Turkey-Lettuce wraps, as well. So, a delicious choice to get us started. Next week we're talking Popcorn and the week after that I'll be hosting. Let me just say it has something to do with roasted red peppers, herbs, and glorious garlic. If you're interest is piqued, you can check out the schedule and cook-along! Yum! Love squash. This is a great way to eat better. Yes! These look so fun, colorful, and delicious....and better yet, I have everything on hand to make these. Don't you love it when a plan falls together like that? I'm excited to follow you along in your journey. I'm tempted to join in but when it comes to food I have a hard time committing myself. Love it! I just may have to play along with everyone. :) I don't think you will have trouble eating healthier, it seems like everything you cook is already pretty healthy. I love the new banner by the way. Thanks so much, Elsa :D ...and YES, I hope you join in! Well, fortunately since I caught the Bittman bug long ago (not to mention the Pollan bug)...we do try to eat pretty healthy. I'm all about adding things and not taking things away. great event. I look forward to your future posts. these skeweres look amazing! Delicious! This is so fun! Glad you pointed this group out to me, Heather. Thanks. Proof positive that healthy eating does not mean austere eating. 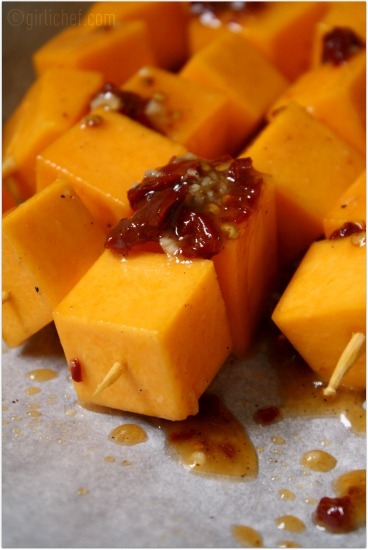 I love roasted winter squash and pumpkin. I've never done it on a skewer before. Your project sounds like a lot of fun! It's so fun seeing how everyone changed up the recipe a little bit. I love the idea of serving this over farro! So excited to be cooking along with you, my love! These look deliciously simple! 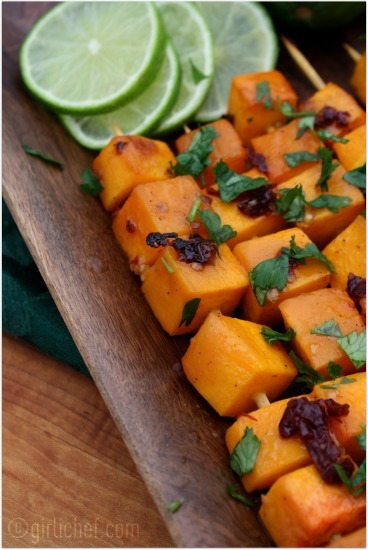 Squash is one of my favorite fiber-rich foods and I love how you've incorporated them in this recipe. I bet the Chipotle glaze totally enhances the flavor. Yum! Looking forward to see those healthy recipes. What a great idea.